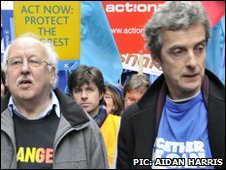 Demonstrations have taken place around the UK to urge action on climate change ahead of the Copenhagen summit. Organisers Stop Climate Chaos want world leaders to reach a tough new deal on cutting emissions. In London, police originally said about 20,000 people had taken part - but did not contradict claims by the organisers that the actual figure was over 40,000. 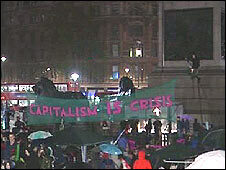 Gordon Brown praised the protesters for "propelling" leaders to reach the "first world climate change agreement". About 7,000 turned out for a demonstration in Glasgow. A protest also took place in Belfast. As the main protest drew to a close on Saturday evening , some 150 protesters from a different action group - Camp for Climate Action - set up camp in Trafalgar Square, central London. Organisers of the camp told the BBC News website they wished to draw attention to the role of the "political and economic system" in causing climate change. The Metropolitan Police said they had been told the camp would remain in place for 48 hours. "A small neighbourhood style police team will be in place to provide a police presence around Trafalgar Square," said a Met spokesman. The prime minister, who met some of the demonstrators in Downing Street, said it was essential that a deal be reached in Copenhagen and leaders had to be "ambitious". Mr Brown said he and the "vast majority of people" were convinced by the scientific evidence for man-made global warming. He said Copenhagen had to convince everyone of the risks, including the sceptics. "There's a flat earth group over the evidence, if I may say so, that exists about climate change, and we've got to show them that the scientific evidence is strong," he said. "The public need to be angry about the extent to which we have not taken action sufficiently as a world until now, and they've got to then see that the first climate change agreement is not only necessary, it's absolutely essential." The demonstrators on Saturday made several demands, such as calling on Western nations to commit to an 80% cut in carbon emissions by 2050. A series of events known collectively as The Wave took place in London. They began with an ecumenical service at Westminster Central Hall, which involved both the Archbishop of Canterbury, Dr Rowan Williams, and Archbishop Vincent Nichols, head of the Catholic Church in England and Wales. Religious leaders said they were taking part in The Wave because they "recognise unequivocally that there is a moral imperative to tackle the causes of global warming". At about 1200 GMT, they joined environmental campaigners, aid agencies, trade unions and organisations including the Women's Institute for a rally close to the US embassy in Grosvenor Square, before beginning their march to the Houses of Parliament. Strathclyde Police said about 7,000 had turned out, which is believed to be Scotland's largest protest in support of action on climate change. 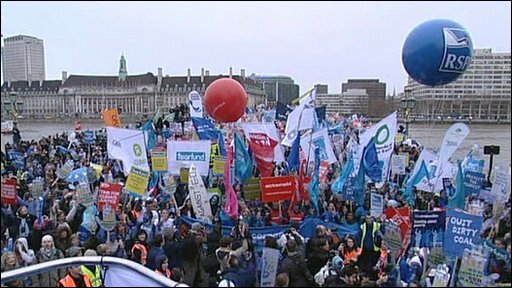 A sea of people, some dressed head-to-toe in blue, formed The Wave on the streets of Westminster. But behind the blue face-paint and carnival atmosphere, the organisers from Stop Climate Chaos said their message was deadly serious. They want to put pressure on the government ahead of next week's Copenhagen summit. The coalition is made up of more than 100 groups from the Women's Institute to trade unions. All are determined that the summit should avoid a fudge and take concrete steps to limit global warming. Ashok Sinha, from the Stop Climate Chaos coalition, said: "We will call on Gordon Brown to make Copenhagen count by committing rich countries to reduce their emissions by at least 40% in the next 10 years, finally putting the right sort of money on the table to help poor countries, and urgently start the process of decarbonising our energy supply. "With bold leadership at home, Mr Brown can help inspire a fair, effective and binding international deal at Copenhagen." Mr Brown will join Barack Obama in Copenhagen next week, after the US president announced that he had changed his plans and would now attend the end of the conference. Ahead of the summit, Climate Change Secretary Ed Miliband took part in "the first ever ministerial mass phone call" on Saturday, after inviting questions from members of action group 38 Degrees via his website, Ed's Pledge. He told the BBC: "We're going to go all out, the whole of the British government, over the next two weeks to make sure we get the most ambitious agreement we can." Any agreement made at Copenhagen must become a legally-binding treaty "within months", he added. Barbara Stocking, chief executive of Oxfam, said world leaders must do more to help those in developing countries cope with the effects of global warming. "For poor people, climate change is not something in the future. Climate change is hitting them now," she told the BBC.